Does Apple's errant 4K monitor post point to imminent Mac Pro launch? Apple mistakenly uploaded, and then quickly deleted, a Sharp-built 4K 32-inch monitor to its European store today suggesting that the Mac Pro launch may be imminent. The Mac Pro, with its two dedicated AMD FirePro GPUs, is the only Apple device that could support a 4K screen. We already know that the Pro has a December launch date, so it's likely that the upload was a telling mistake. As far as we know, Apple doesn't manufacture its own 4K monitors, so it looks like Sharp will be leading the line when the Mac Pro is launched. It's not a stretch, however, to think that Apple will look at developing its own monitors at some point in the near future. 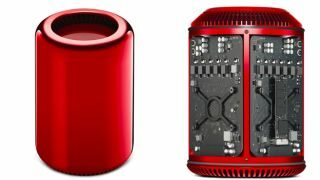 The Mac Pro is expected to retail at an incredible $2,999 (around £1,846, or AU$3,088), so be prepared to break open that mansion sized piggy bank you don't have. To justify that cost, as well as the twin AMD FirePro GPUs, it will come with between 256GB and 1TB internal storage and an Intel Xeon E5 processor that ranges from a quad-core version to a comically large 12-core.